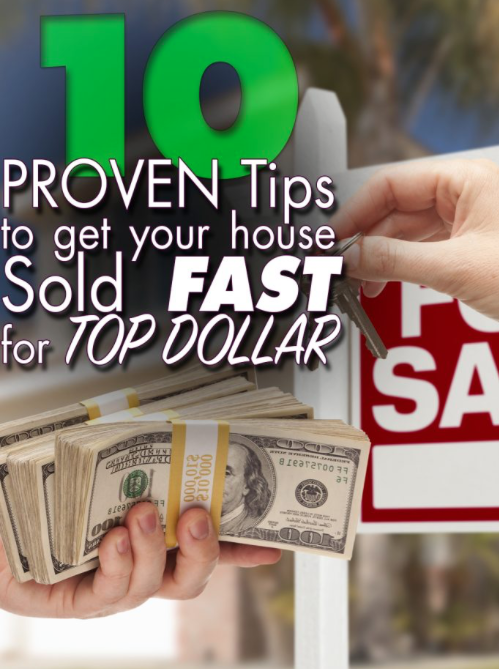 I look at selling your home as an huge money-making opportunity. Here’s why – what is your current hourly wage at your job? If you’re like most Americans, it’s somewhere between $20 and $40 an hour. What if I told you that selling your home will give you the opportunity to make HUNDREDS per hour? It’s true. Thank about it… imagine you want to get your house on the market in exactly one month. And during that month, you invested 50 hours and about $500 getting your house in tip-top shape (that’s 8 hours per weekend, plus one hour per evening during the week). If you follow the steps below, those 50 hours could easily get you an extra $10,000 or more for your house. That’s $200 an hour people! And it could easily be more. Don’t just list it right away. Don’t feel like you have to get it on the market ASAP. Make a list of what needs to be done (many of the those items are below), and then set a reasonable time that it will take to get them done. Make that the day you will list. Also – keep in mind that if you think you’re only a week or so away from listing, you can go ahead and get it on the MLS listing and have showings scheduled. Just let the realtor know that there will be no showings before a certain date. 2. Ask for outside opinions of things that need to be done in your house. You know that trim in your kitchen that you planned on painting, but only got the primer on? Oh wait, that’s my kitchen… the point is, I never even notice that trim anymore. Yes I’ll get to it someday, but we have a tendency to overlook imperfections in our own home because we are so used to seeing them. But prospective buyers will see EVERYTHING. Invite some friends over and have them be brutally honest with how your house looks – inside and out. They will mention things you’ve never even thought of. This will help you compile your to-do list. 3. Treat it like a business. Your house is no longer just your home, it’s an asset you are trying to get top dollar for. I know that your house has so much meaning to you… the way it’s painted, the stuff you have on your walls… none of it matters anymore. Your house is now an asset for sale. It’s an asset that you want to get top dollar for. This also means that you have to be very accommodating to showings. Yes, it’s always inconvenient to show your house, but you need to work on the schedule of prospective buyers, not the other way around. Remember, the goal is to have as few showings as possible. You want one of those first ones to make an offer and sell it! Have you seen those pictures of living rooms in the furniture advertisements? They look fantastic, don’t they? There’s a couch, a chair, a couple of end tables, window treatments, and just a couple decorations on the wall. And that’s it. Now look around the room that you’re in right now. It might be your living room or your bedroom… but how much more stuff does your room have in it compared to the picture in the ad? Probably a TON. I’m not saying you have to make it look just like those pictures, but try to get it close. You are trying to sell your house, not your stuff. So showcase your house. For every piece of furniture, ask yourself if it adds to the overall feeling over your home or not. If it doesn’t, get rid of it. Think of it as pre-moving. EVERYTHING in your home is coming out anyway, you’re just getting a head start. 5. Do some research on staging. There’s a good chance that your furniture has been arranged the same way for a decade. And that’s fine – it could be the best way to showcase your home. But there might be a different way to stage your house that you’ve never thought of. Do a quick google search on home staging and you will find lots of free advice and info our there to give you some different ideas. I write about how to get your house ready to sell without spending too much in my Book. I would love to give you a free copy to help! Think of fresh white towels and throw rugs in your bathrooms. Keep them in the closet, and when you have a showing throw your old ones in the hamper and put the new ones out. Consider putting fresh flowers out as well. Freshly painted rooms look so clean. Every single little mark or scratch that have added up over the years will disappear, and your walls will once again look vibrant and new. Stick to neutral colors. Oh, and that reminds me… do you have any kids who had their bedrooms painted with bold crazy colors? Yeah, time for those colors to go. Remember point number 3 – this is not just your home anymore, it’s an asset. And your prospective buyers are mentally keeping a tally of jobs that they will need to do when they move in. Also – while you are painting, consider different window treatments in some of the main rooms. They don’t need to be expensive, but a few hundred dollars spend on curtain rods, curtains, and nice 2″ white blinds will go a long way. 7. Focus on curb appeal. For better or worse, people do judge a book by it’s cover when it comes to houses. So do your best to make it look nice. Obviously, this isn’t the time to do any huge projects to significantly change the look of your house. But there’s still plenty you can do to improve the look of your house without spending much money. Give it a good powerwash, especially if you have vinyl siding. Either rent a machine and find a buddy who has one. Fix all the little stuff. Are there any trim pieces on your porch that have rotted and need to be replaced? Are there any broken pieces of siding? Could paint be touched up in a few spots? Now is the time to do it. Get fresh mulch. It looks so nice and won’t cost you much at all. Keep your lawn mowed, keep the toys out of the front yard all the time. You never know when someone is driving by. 8. Have a plan for when the call for showing comes. When that call comes for a showing, it can be both exciting, and dreadful. It seems like the timing is usually terrible, your house is a mess, and you only have an hour and a half to make the house presentable and get the family out. This is why you need to have a plan. At this point, you’ve already de-cluttered, so you should have nearly as much stuff lying around as you did before. The way things are now, everything should have a place to get it out of site. In addition, furniture and decor should be staged at all times now. So what is left to do? Clean all dishes and put them away. Put all clothes in dressers, on hangers or in covered hampers. Try not to have clothes in the washer or dryer, those strangers in your house are likely to open the washer and dryer. Wipe down all counters, sinks and appliances. Have clean unused linens on hand. Keep them folded up in a chest or dresser, and pull them out to place in the kitchen and bathrooms when you have a showing. There is no excuse to not have great photos these days. Everyone has a smart phone that has pretty amazing auto-light balancing features. But when I peruse listings, I see so many bad photos! And photos are important – it’s how you get people in your house. Don’t let your realtor take your photos. They might know what they’re doing, but you can do better. When You HIRE me I have the pictures professionally done! Get your house in showroom condition – as PERFECT as possible. Take the photos during the daytime with blinds and curtains letting in as much daylight as possible. 10. Price it right out of the gate and get your realtor excited. Pricing is really tricky, and this is one area that you will need to rely on your realtor for advice. You want to sell it fast… but if it sells too fast, maybe you priced it too low. On the other hand, if you price it too high, then it might sit for longer than you want and that buzz and excitement will wane. Prospective buyers will see that it’s been sitting for a while and will be more likely to come in with lower offers.